South America is a land of contrasts and the animal population of Venezuela is fabulously diverse. In our travels we spent time on arid islands, rain- and cloud-forest, high mountain passes above tree line, deep river valleys and flooded plains. 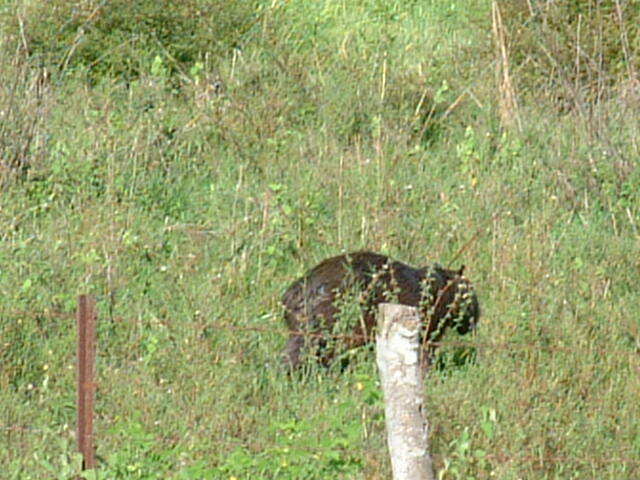 The larger mammals we hoped to see, but did not, were the South American bear and the giant anteater. The first for its scarcity, and the latter for our arrival in the wrong season (wet as opposed to dry). We did see, but didn't photograph, several pink river dolphins. 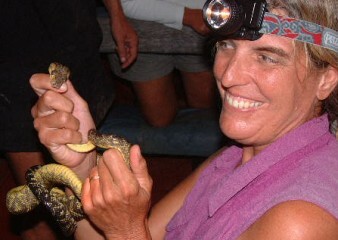 Venezuela has many reptile species and we saw, and photographed, several. Go to our Venezuela Birding page to see some of the fabulous avifauna of the country. 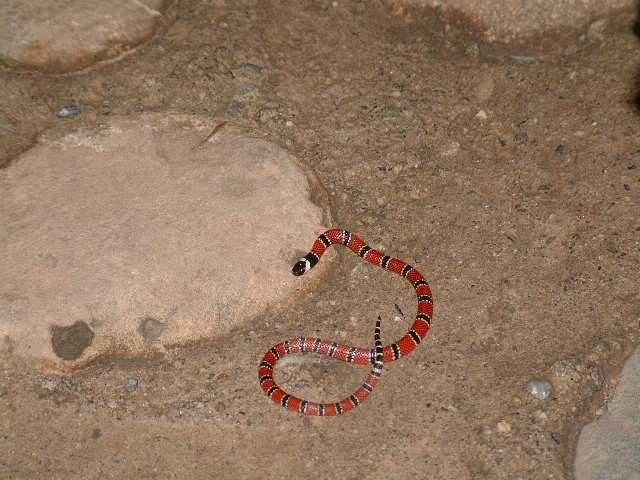 This young coral snake we found in the grass by our rafting camp at an elevation of about 1000 feet in the foothills of the Venzuelan Andes. There are several species native to Venezuela, and all are poisonous. We didn't pick up this little 18cm (6-inch) guy. 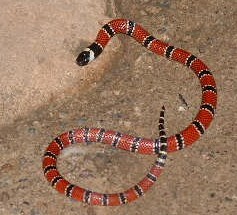 Our jingle for the North American coral snake: "Red and yellow kill a fellow, red and black friend of Jack" does seem to work for this species, although the "yellow" is more like white. 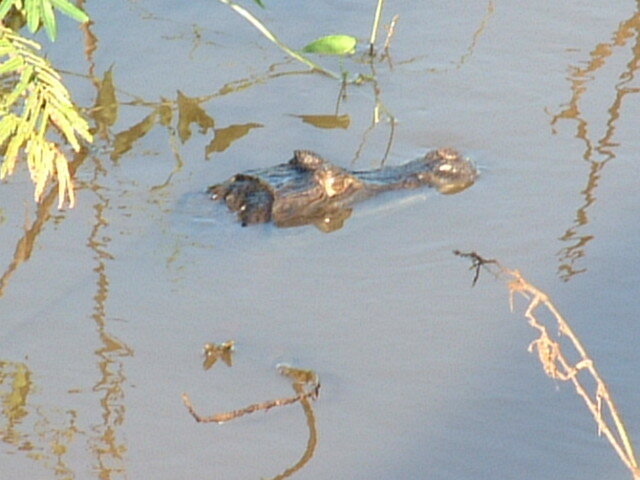 Fresh water caiman inhabit the rivers and tributaries of Los Llanos, Venezuela. During the day they tend to laze about in the cool water. 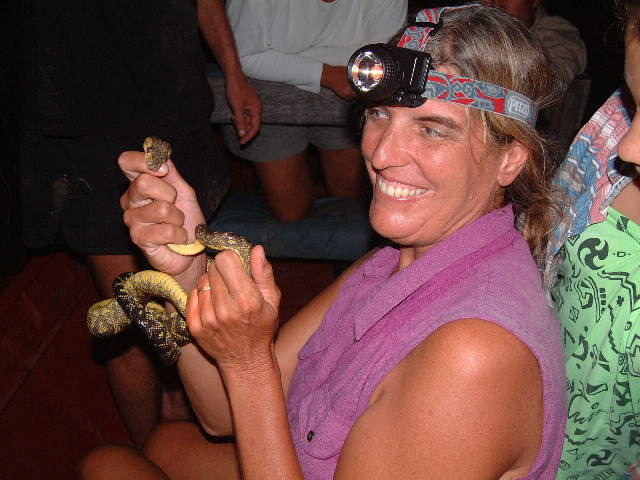 At night, as we motored along the river our flashlights picked up the red gleaming eyes of dozens of them on the river banks. 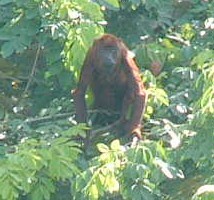 They reach only about 2.4m (8 feet) and are not very aggressive. 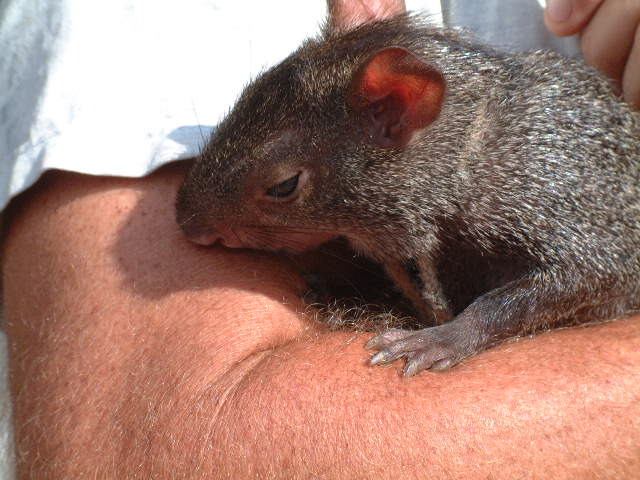 Their relatives on Venezuela's Orinoco River to the east are very aggressive and half again as large. 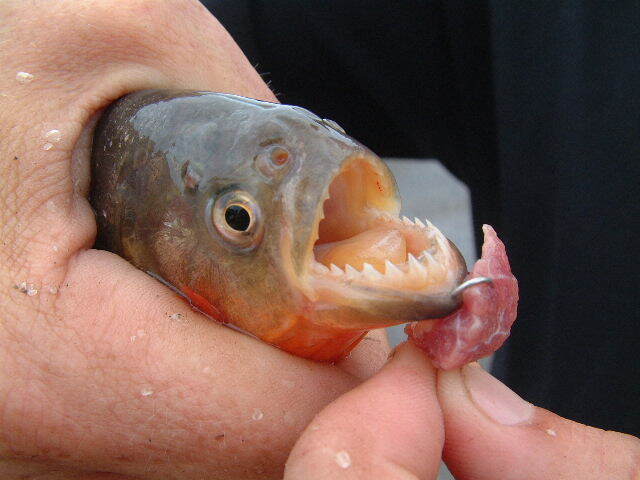 This piranha lives in the floodwaters and tributaries of the Apure River, in central Venezuela. We fished for them and caught enough for a tasty dinner. (That's poetic justice, I think.) There are over 20 species of piranha, but only 2 are carnivorous, including this 18cm (6-inch) orange-bellied one. It and its fellow piranhas stripped the meat off a cow leg in a couple minutes. 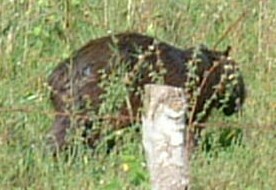 The world's largest rodent, the capybara, inhabits the grasslands and watering holes of Venezuela's plains, called Los Llanos. The largest concentration are found near and within the borders of private ranches where they are protected from hunters. 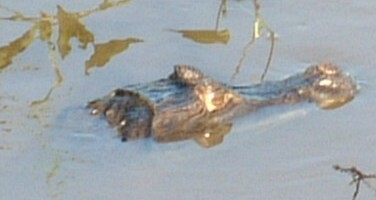 They stand about 75cm (2 ft) tall, and about 1.3m (4 ft) long. In the watering holes they look much like small hippos. 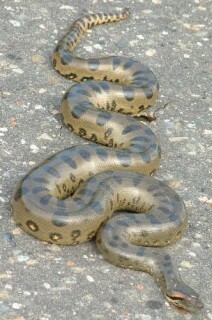 Venezuela is home to the South American anaconda which is the world's largest snake. 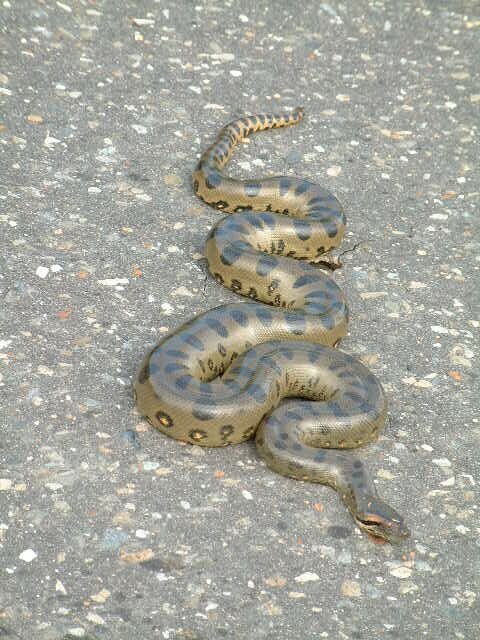 This one on the road, warming up after a heavy rainfall, was only about 3m (9ft) long. He was quite docile, and not perturbed by all the attention as we came up to take photos. 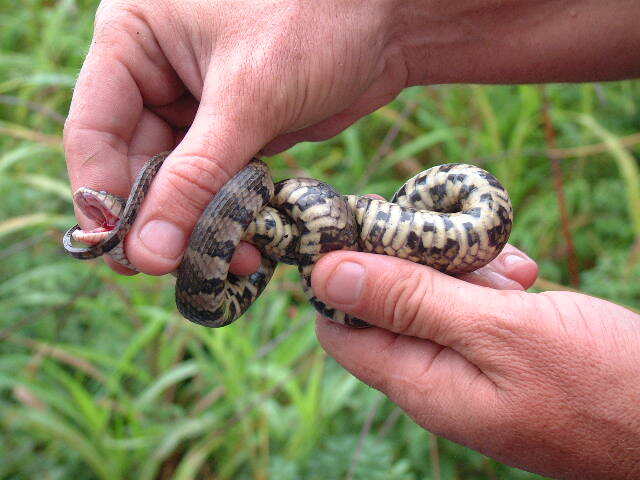 Boa constrictors are Venezuela's other constricting snake beside the anaconda. This one was small enough for our guide, Alan, to handle briefly. It has a ways to grow before it can swallow an elephant and feature in Le Petit Prince. The Venezuelan tree boa bears a striking resemblance to the extremely poisonous fer-de-lance, with its triangular head and similar markings. Our guide in Los Llanos, Alan, didn't used to mess with these snakes until he learned that there are no poisonous tree-dwelling snakes north of Venezuela's Orinoco River (where we were), and the fer-de-lance eyes don't glow red in the lights at night. So, he picked this 3-footer off a branch and of the 7 of us, only Sue wanted to hold it. 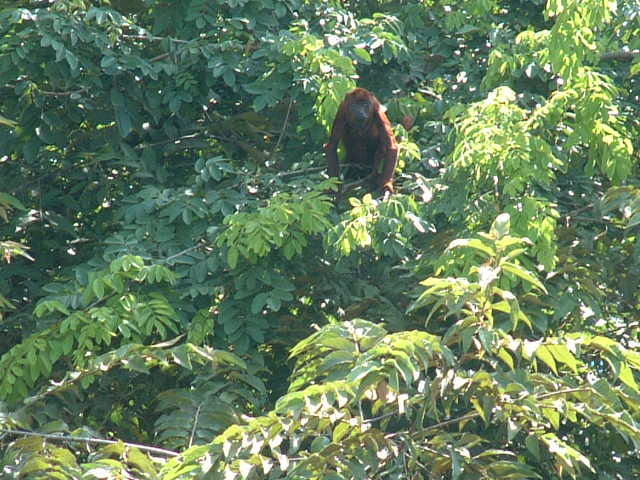 Hoots, screams, and howls told us we were approaching a band of red howler monkeys high in the trees above the Apure River, Venezuela. Photos were hard to get, but this animal sat still awhile to watch and mock us. Others took off, swinging through the branches, calling to each other. We also saw spider monkeys and capuchin monkeys (which are frequently captured for the pet trade). A sad, but informative photo: On one shore of the Venezuela's Apure River lay a huge farm with a border of native forest which the owner had left natural as a wildlife corridor. 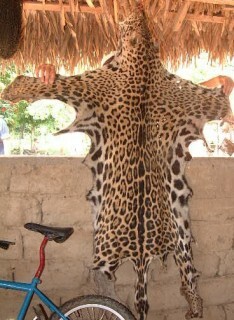 Unfortunately, the jaguars that still prowl the forests don't know which river bank is safe and which is not. This one crossed the river and began killing goats and farmyard animals at a small farm. The farmer, who we met along with his 10 grandchildren, had no compunction about hanging the skin to dry inside the verandah of his mud brick home. 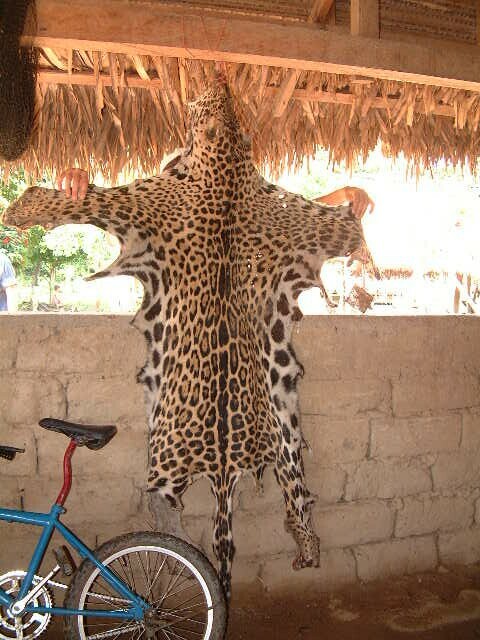 Jaguars are endangered, and protected by law, but there will be many more killings like this until the government does more to encourage the ranchers to keep larger tracts of land wild. The present government takes "unused" land away from ranchers and redistributes it.